남원 실상사 약수암 목각아미타여래설법상(南原 實相寺 藥水庵 木刻阿彌陀如來說法像)는 나무에 불상을 조각해서 만든 탱화인데, 탱화는 대개 천이나 종이에 그린 그림을 족자나 액자형태로 만들어 거는 불화를 말하지만 나무로 조각한 것이 특이하다. 크기는 가로 183㎝, 세로 181㎝로 거의 정사각형에 가까우며, 현재 전하고 있는 조선 후기의 목조 탱화 가운데 가장 간략한 배치구도를 가지고 있다. 화면은 크게 상하로 나누었는데, 하단에는 아미타불을 중심으로 오른쪽으로는 보현보살과 세지보살을, 왼쪽으로는 문수보살과 관음보살을 배치하였다. 상단에는 석가의 제자인 아난과 가섭을 중심으로 오른쪽으로 월광보살과 지장보살을, 왼쪽으로는 일광보살과 미륵보살을 배치하였다. 본존인 아미타불은 타원형의 광배를 가지고 있고 사자가 새겨진 대좌에 앉아 있다. 불상들은 모두 사각형의 넓적한 얼굴에 근엄하면서도 친근감이 넘친다. 좁은 어깨가 목 위로 올라붙어 마치 앞으로 숙인 듯한 자세를 취하고 있으며 양 어깨에 걸친 옷자락은 길게 연꽃의 대좌 밑까지 흘러내리고 있다. 정조 6년(1782) 제작된 것으로 제작연대가 확실하고 원만한 불상들의 모습과 배치구조, 정교한 세부조각 등은 조선 후기 목각탱화의 기준이 되는 중요한 작품으로 평가되고 있다. The Wooden Amitabha Buddha Altarpiece at Yaksuam Hermitage of Silsangsa Temple in Namwon is a unique kind of taenghwa (an altar portrait of Buddha) that was made by carving the Buddha statue on a piece of wood. However, taenghwa usually consisted of an image of the Buddha drawn on cloth or paper for a hanging scroll or frame. This square-shaped wooden Amitabha Buddha altarpiece is 183cm wide and 181cm long. 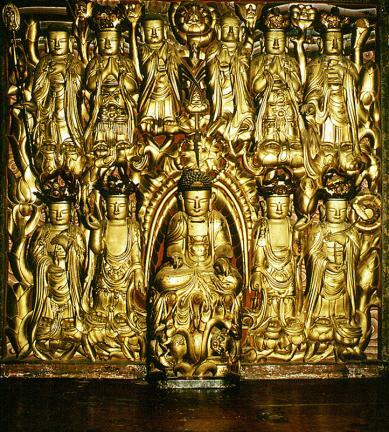 It has the simplest composition of all the extant wooden altarpieces made during the late Joseon Dynasty. In the bottom part of the screen, the principal statue of Amitabha Buddha stands at the center, flanked by Bohyeon Bodhisattva and Seji Bodhisattva on its right and Munsu Bodhisattva and Avalokitesvara Bodhisattva on its left. In the upper part of the screen, Buddha's two pupils, Anan and Gaseop, can be seen at the center, flanked by Wolgwang Bodhisattva and Ksitigarbha Buddha on the right and Ilgwang Bodhisattva and Maitreya Bodhisattva on the left. Amitabha Buddha is sitting on the pedestal, which is engraved with lions and has an oval mandorla (Buddhist halo of light). All of the images of Buddha have flat, quadrilateral faces that look solemn yet friendly. Narrow shoulders are raised up to upper neck so their heads look like bowing. The clothes draped over their shoulders are extended to the end of the pedestal, which is decorated with the patterns of the lotus flower. The inscription reveals the exact production date to be 1782 (the 6th year of the reign of King Jeongjo of the Joseon Dynasty). The ordinary shape of the images, structure and sophisticated engravings make this an important example of a typical wooden taenghwa of the late Joseon Period.